1Department of Biological Sciences, Pakistan Institute of Engineering and Applied Sciences, Islamabad 45650, Pakistan; 2Department of Agronomy, University of Agriculture, Faisalabad 38040, Pakistan; 3In-Service Agricultural Training Institute, Sargodha 40100, Pakistan; 4In-Service Agricultural Training Institute, Rahim Yar Khan, 64200, Pakistan; 5Institute of Horticultural Sciences, University of Agriculture, Faisalabad 38040, Pakistan; 6Department of Soil and Environmental Sciences, College of Agriculture, University of Sargodha, Sargodha 40100, Pakistan. Fertilizers are an important agricultural input for improving crop productivity. However, chemical fertilizers are prone to losses and fixation thereby decreasing the nutrient use efficiency. Plant growth promoting rhizobacteria (PGPR) can be applied to improve the growth and yield by improving nutrient availability to crop plants. 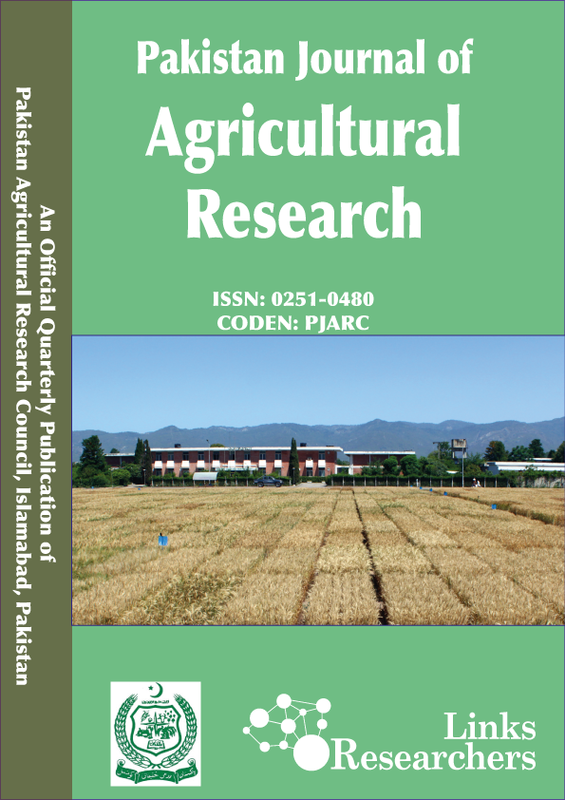 A field experiment was carried out to determine the effect of seed inoculation with PGPRs on yield and quality of different genotypes of soybean. Seed inoculation treatments [control (no treatment), nitrogen fixing bacteria (Rhizobium japonicum) and phosphorus solubilizer (Pseudomonas fluorescens)] were applied to three different cultivars of soybean (EBR4V4, Freedom and Swat-84). The results showed that seed inoculation with R. japonicum and P. fluorescens improved the grain yield, biological yield, oil content and protein content of soybean, as compared to un-inoculated control. Seed inoculation with P. fluorescens was more effective than R. japonicum in improving grain yield and quality. The genotypes did not differ significantly in grain yield, biological yield and oil content; however, differed in protein content. Swat-84 was superior among all genotypes pertaining to yield formation and protein content. In conclusion, seed inoculation with R. japonicum and P. fluorescens improved the yield and quality of soybean genotypes thus could be employed to improve the soybean productivity.